Frigid sunset on Mount Shasta. 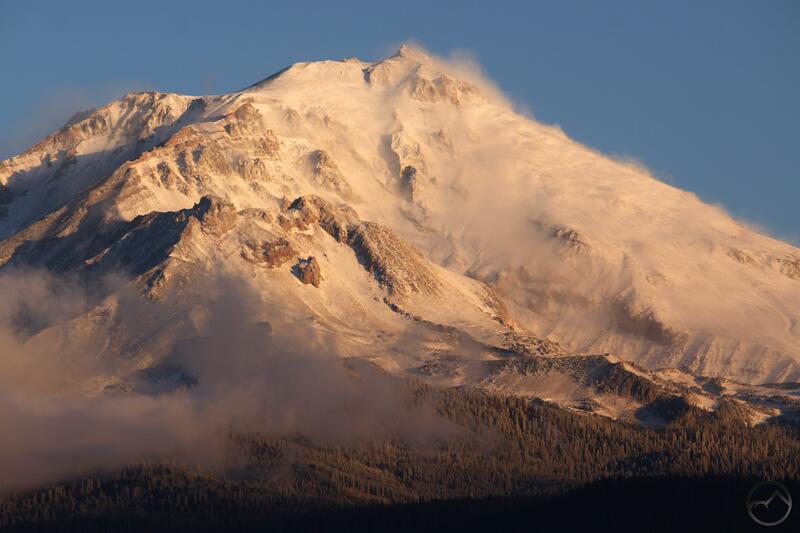 Last week finally saw winter’s return to the Mount Shasta area. Cold temperatures had been around for a while but the snow had not yet set in. It seemed as though autumn was fighting to maintain its dominance until Christmas at which time it would finally allow winter to assert itself over the region. Obviously this was not to be the case and the week after Thanksgiving saw the arrival of snowy conditions for the first time. 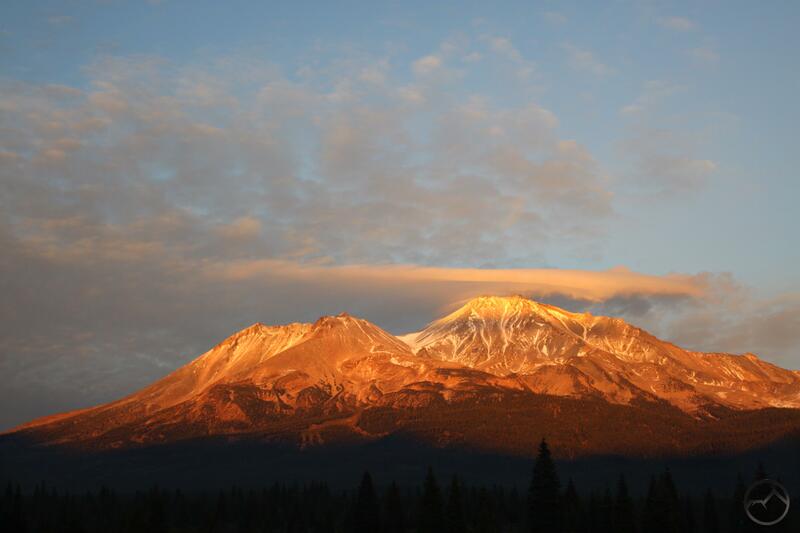 Windy sunrise on Mount Shasta. The initial onslaught was a short burst of rain. Not surprisingly this translated into a thin layer of snow on Mount Shasta. While it may rain everywhere else around Mount Shasta, the giant volcano’s tremendous height yields colder temperatures and, consequently, snow when none has fallen elsewhere. This was not the first time the mountain has been cloaked in white this fall but like all the other times, the winds picked up and the ice was blasted off of peak. It would take a stronger storm with more precipitation to successfully cover the mountain with a healthy layer of snow. While the wind strips the mountain clean again, and it would be a miserable place to be in those conditions, it still creates wonderful images from down below. Looking up at the mountain when it seems that it is shrouded by what seems to be a wispy cloud and realizing that it is snowy being hurtled through the air by fierce winds always makes me want to stop and pull out my camera. If the conditions are highlighted by sunrise or sunset, so much the better! 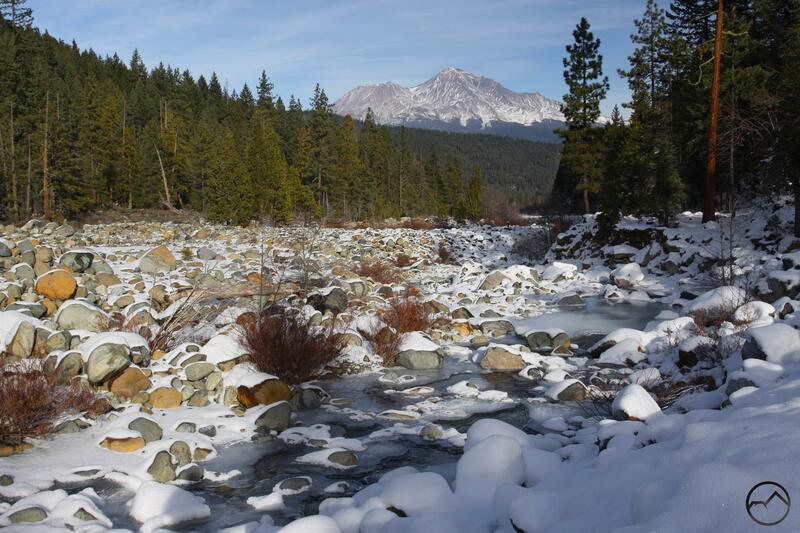 Mount Shasta gazes down on the frozen Sacramento River. Immediately after the first storm, the temperatures plummeted. Day time highs ranged from lower 10’s to lower 20’s. At night it got down to around zero in some places, including my house. I live outside of town at a higher elevation so we are always colder (and snowier) than weather reports for Mount Shasta City. The frozen temperatures were actually enjoyable and made for some beautifully unusual conditions, especially along the Sacramento River. This area is one of my favorite spots around Mount Shasta. 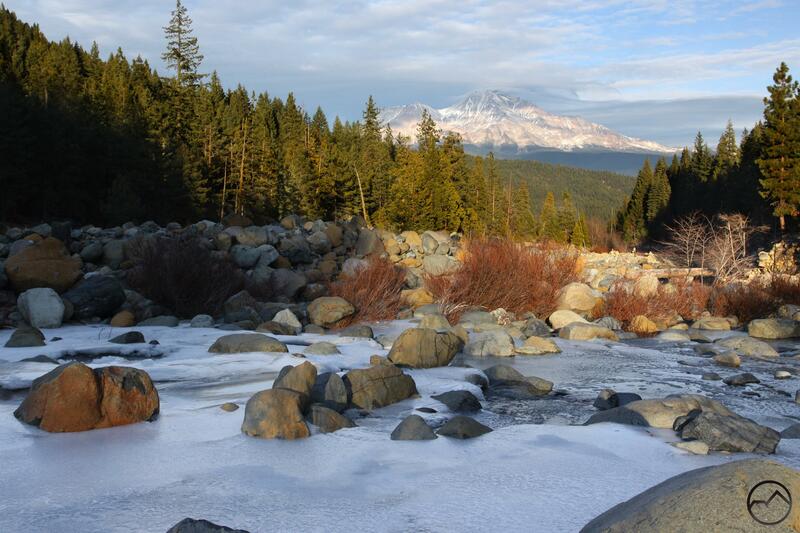 The broad, rocky channel of the river makes a great foreground below Mount Shasta. The rushing river and the multi-colored boulders are always visually appealing when contrasted against the great heights of the mountain. In the freezing weather, the river was given a new personality. Rather than the swift river one normally finds, the Sacramento was burdened with a thick layer of shimmering ice. The crystalline flow stood in stark opposition to orange, red and gray boulders dotting the river’s channel. Adding to the surreal setting, the river could still be heard running beneath the ice. In a few places the living water emerged into the sunlight, only to once again be swallowed up by the frozen crust. Snow finally did arrive for the first time in the valleys. We got about 6 to 8 inches around the house. This is just about the perfect level of snow since it covers everything and really FEELS like it has snowed but it is not so deep that it requires a lot of work to manage. It also makes dresses the mountains in their winter attire without cutting off access to many of the trailheads. Of course, it is necessary to have a 4×4 to reach some of these spots but it is nothing like the big storms where several feet of unplowed snow build up on the mountain roads and access is much more difficult. The snow also came at the perfect time to head out to the woods to get Christmas Trees. While we have a few spots where there a lot of good trees in areas that need to be thinned, the best of them was still accessible across the divide from the South Fork Canyon. The Trinity Divide was particularly beautiful beneath the freshly fallen snow. The frozen lakes, snow-laden trees and icy river were invigorating. Many Lakes Mountain rises above frozen Mumbo Lake. Massive icicles form on a seep next to the snow-covered Sacramento River. Unfortunately the snowy conditions did not last. A few days after the storm, the winds returned and the temperatures rose a little above freezing. I returned to the South Fork to hike the PCT. While there was plenty of snow on the ground, I was amazed at how quickly the trees and south-facing peaks and ridges had shed their mantle of ice. I hiked out through the snow to Gumboot Point. 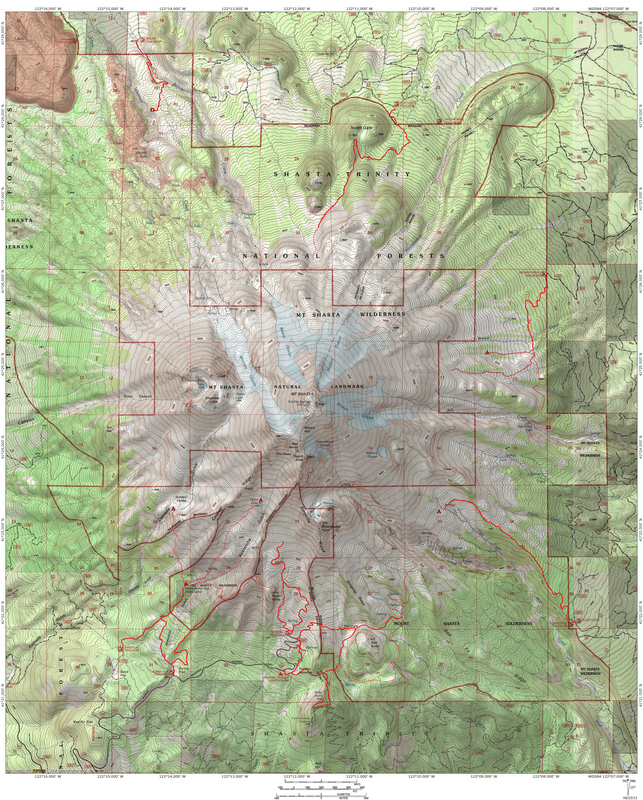 This is one of the best view points in the Mount Shasta area and it is amazing just how easy it is to bet to. From this vantage I could look out at the Trinity Alps, the Scott Mountains, the Trinity Divide and magnificent Mount Shasta. Looking about at all of these mountains, I was surprised just how much the snow had already receded. Mount Shasta in particular had been scoured clean by the wind and was already the semi-naked mountain that it has been for the last few months. While disappointed that it had not lingered as long as I would have liked, I was still grateful for the opportunity to behold such a magnificent vantage so soon after the storm. The Scott Mountains, Mount Eddy, Porcupine Peak and the Gumboot Lakes. Mount Shasta and the South Fork Canyon. As I drove home, I stopped again at one of my favorite spots along the Sacramento River to enjoy the afternoon light on Mount Shasta. Some of the ice had melted off of the river but there was still plenty of frozen spots to add a lot of interest. Now the ice was mixed with the snow that covered the boulders that litter the Sacramento’s channel. As I packed up to finish the trip home, I thought about how winter may inhibit hiking opportunities, but it does highlight the beauty of this spectacular region. Mount Shasta and the snowy Sacramento River.